As we age, the body releases fewer and fewer ADULT STEM CELLS which are the body's rebuilding tools. STEM CELL NUTRITION helps overcome the Ageing Process by promoting the release of additional ADULT STEM CELLS in the body. 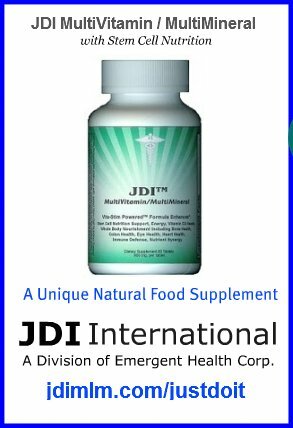 JDI International is a Division of SAS Health and Beauty Corp. We are excited about our new product line that we think makes us leaders in the Nutritional Supplement field and more specifically in the area of Stem Cell Nutrition. Our products help your body increase adult stem cells which are the natural repair method of the body. Likewise, our lead product also supplies the necessary vitamins and minerals that up to 90% of the population is said to be lacking. In a sense that is a two for one feature. We call this product JDI Multi with NeuSten Cell Nutrition. Both of these products are patented and not available anywhere else! We also offer a concentrate of NeuStem Cell Nutrition for those who need a stronger product. Neither of these products is associated in any way with Embryonic Stem Cells! 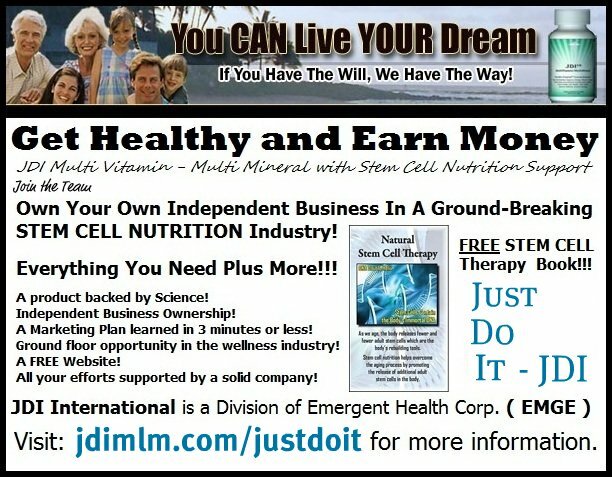 If you wanted to know more or are already taking and sharing JDI's Stem Cell Vitamin, this will be of benefit to you. The first thing is to ask is "Do you know what the natural renewal system of your body is?" In practically all cases, most people say NO. In the picture below, we have an injury to the tissue of the hand. 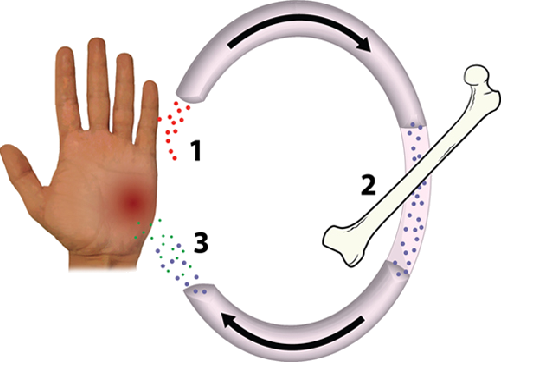 Molecules from the area signal to the bone marrow to release Adult Stem Cells. Adult Stem Cells from the bone marrow are released. They travel and hone into the injured tissue where a key molecule causes them to leave the bloodstream, enter the tissue where they will proliferate into new cells and do the necessary repairs. This is all well and good, but as we get older fat displaces some of the bone marrow in our long limbs. The stem cells in the bone marrow also become dormant and this natural process slows down. We then a walk a thin line trying to balance between cellular breakdown and renewal. Another product we offer is SAS Facial Lift Spray. It works like Botox for a day and the longer a person uses it, the more the benefits seem to improve. You can simply become a customer and enjoy the benefits of our products or you can become a Member and develop a good part time income. Either way, there is no pressure and you have nothing to lose by just taking a look. 1. The ResoluCan product provides the minimum daily requirement of the most commonly needed Vitamins. 2. ResoluCan nutritional support also provides a baseline of the most commonly needed minerals. 3. ResoluCan nutrition support also provides many micronutrients both on trace mineral quantity and trace amino acids. 4. Another component of ResoluCan nutriton support is adult stem cell nutrition support. This is provided by the Vita-Stim Stem Cell Nutrition Concentrate™ incorporated into the ResoluCan product. We believe it adds to the natural renewal system of the body. First, the study results are now becoming better defined and providing useful data. Second, it is now possible to get higher quantities of ellagitannins per serving. Third, added studies have provided confirmation. A. Consuming an ellagitannin source that will evoke an amount of ellagic acid from the ellagitannins prevents the development of cancer cells. At low concentrations, it slows the growth of cancer cells; at higher concentrations, it tells cancer cells to kill themselves. For example, cells infected with the human papilloma virus (which is linked to cervical cancer), when exposed to ellagic acid from ellagitanninsexperienced apoptosis, or normal cell death. B. Ellagitannins slow the growth of abnormal colon cells in humans. produce a breakdown in human leukemia cells. D. Another way that ellagitannins protect your body is through G-Arrest. G-Arrest means that the ellagitannins stop cells from mutating in the first place. If cells don't mutate, then we don't get cancer. This is very important when you understand that that every single day of your life you produce anywhere from a few hundred to as many as 10,000 cancerous cells in your body as part of your normal metabolism. In tests conducted by the Hollings Cancer Institute with Ellagic Acid, G-Arrest began in 72 hours in both breast and cervical cancer. E. Ellagitannins prevent destruction of the P53 gene by cancer cells. P53 prevents mutagenic activity in cervical cells. F. Ellagitannins protect human cells against cancer-causing agents in tobacco smoke, food additives, and petroleumbased substances. Ellagitannins act as scavengers to “bind” cancer-causing chemicals, making them inactive. The ellagitannins inhibit the ability of other chemicals to cause mutations in bacteria. Ellagitannins also protect DNA by blocking carcinogens from binding to the DNA. 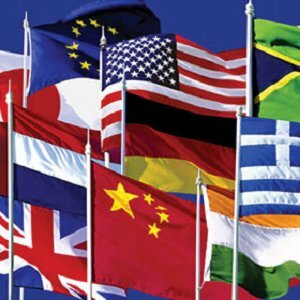 G. European medical studies also demonstrate that ellagitannins lower the incidence of birth defects, promote wound healing, reduce heart disease, and may reduce or reverse chemically induced liver fibrosis. In addition, the ellagic acid produced from the ellagitannins has anti-bacterial and anti-viral properties. 7. ResuluCan nutritional support has identified a natural source of ellagitannins that can help utilize a considerable amount of ellagic acid per gram of ellagitannin source in an easy to use form that is both tasty and consumable at a reasonable price. 8. ResoluCan nutritional support is both patented and patent pending. 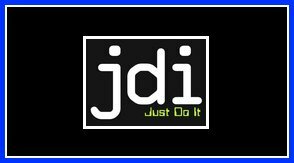 ResoluCan™ Nutritional Support is a product of JDI International. What Is Cancer Nutritional Support? According to the National Cancer Institute, nutrition in cancer care embodies prevention of disease, treatment, cure, or supportive palliation. Caution should be exercised when considering alternative or unproven nutritional therapies during all phases of cancer treatment and supportive palliation, as these diets may prove harmful. Patient nutritional status plays an integral role in determiningb not only risk of developing cancer but also risk of therapy-related toxicity and medical outcomes. Whether the goal of cancer treatment is cure or palliation, early detection of nutritional problems and prompt intervention are essential. The original principles of nutrition care for people diagnosed with cancer were developed in 1979  and are still very relevant today. Proactive nutritional care can prevent or reduce the complications typically associated with the treatment of cancer. Many nutritional problems stem from local effects of the tumor. Tumors in the gastrointestinal tract, for example, can cause obstruction, nausea, vomiting, impaired digestion, and/or malabsorption. In addition to the effects of the tumor, marked alterations in normal metabolism of carbohydrates, protein, and/or fats can occur. The nutritional prognostic indicators most recognized as being predictive of poor outcome include weight loss, wasting, and malnutrition. In addition, significant weight loss at the time of diagnosis has been associated with decreased survival and reduced response to surgery, radiation therapy, and/or chemotherapy. Malnutrition and accompanying weight loss can be part of an individual’s presentation or can be caused or aggravated by treatments for the disease. Identification of nutrition problems and treatment of nutrition-related symptoms have been shown to stabilize or reverse weight loss in 50% to 88% of oncology patients. >1900 patients in 6 months to validate standardized nutritional triage. [Abstract] Proceedings of the American Society of Clinical Oncology 17: A-282, 73a, 1998. What Is the Goal of Nutrition Therapy in Cancer? 1) Prevent or reverse nutrient deficiencies. 2) Preserve lean body mass. 3)Help patients better tolerate treatments. 4) Minimize nutrition-related side effects and complications. 5)Maintain strength and energy. 6) Aid in recovery and healing. 7) Protect immune function, decreasing the risk of infection. 8) Maximize quality of life. 1) Lessen side effects. 2) Reduce risk of infection (if given externally). 3) Reduce asthenia. 4) Improve well-being. Nutrition continues to play an integral role for individuals whose cancer has been cured or who are in remission. [7 ] A healthy diet helps prevent or control comorbidities such as heart disease, diabetes, and hypertension. Following a healthful nutrition program might help prevent another malignancy from developing.